Trying to keep your cat from clawing at the furniture may make you feel like you and your feline companion are at war. Scratching is a natural behavior for cats, one that you won't be able to train out of them. While some people have their cats declawed to deal with scratching behavior, a more humane way to curb kitty's propensity for sharpening his claws on your couch is to build him a scratching post. 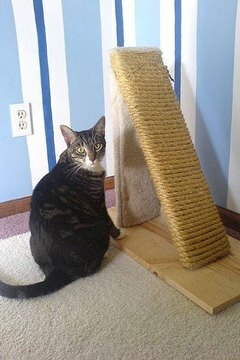 If you've ever been to a pet store, you have likely seen a scratching post: a post or frame covered with carpet. And while there are plenty of choices in building materials, one that is gaining in popularity over synthetic fibers is sisal fabric or rope. Sisal is a natural, plant-based fiber that is woven into ropes and rugs for commercial use. Cats seem to prefer sisal for scratching against over other fibers. In fact, if you have sisal rugs in your home, your cat will ignore other fibers in order to knead her paws on the rug. An effective scratching post is a sturdy one; in addition to scratching the post, your cat will be climbing on it and rubbing against it. A scratching post that easily topples over can scare your cat and cause injury. Use a heavy base made of plywood, about 3/8-inch thick and about 60 percent of the height of the scratching post. The post itself can be made from a fencepost or landscaping timber. You will need a saw, a drill and screws to attach the post to the base. You will also need a carpet knife to cut the carpet, and a staple gun with long staples to attach the carpet to the base. Attach your post to the center of the base with wood screws. Measure your base, and cut the carpet to fit. Attach the carpet with a staple gun and long staples. Over time, as your cat wears down the carpet, you will need to replace it. To do this, pry up the staples with a flat-head screwdriver, and staple down new carpet in its place.